Barcelona beat Manchester United with a landslide score of 3-0 in the Champions League quarter-final second leg. Barcelona also has the right to qualify for the semifinals. Everything seems to be going well for Man United at Camp Nou. Left behind by one goal from the first leg, Man United played open at the start of the first half. The opportunity was immediately obtained by Marcus Rashford when the game had only been running for one minute. Receiving feedback from Paul Pogba, Rashford immediately kicked off which unfortunately still hit the crossbar. Rashford then had another chance, but his shot was weak and easily anticipated by Marc Andre ter Stegen. Man United’s disciplined game can only last 15 minutes. Because, one minute later the mistake made by Ashley Young made Man United punished by Messi. One thing that might make Man United forget: Messi is one of the best players in the world and only needs one small chance to score! Lionel Messi opened Barcelona’s lead in the 16th minute. Messi made use of Ashley Young’s blunder in Manchester United’s defense to get the ball. 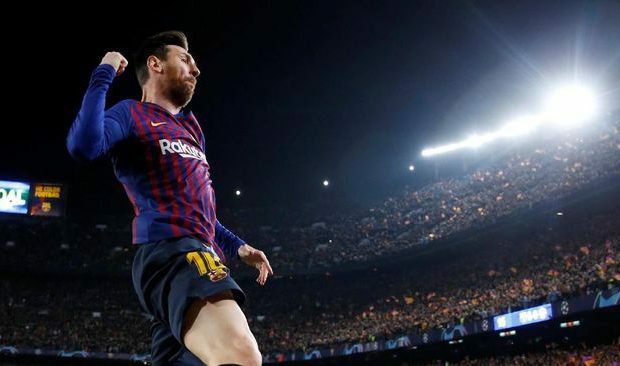 After getting the ball, Messi brought the ball to the front of the Manchester United penalty box before releasing a kick towards the far post that could not be reached by Manchester United goalkeeper David De Gea. Four minutes later, Messi again listed the name on the scoreboard to change the position to 2-0. The error of Manchester United’s back line in their defense area again made Messi have the ball. In front of the penalty box, Messi kicks off again, this time with the right foot. Messi’s kick was not too dangerous but De Gea’s error when catching the ball made Barcelona get the second goal. Man United can only blame themselves behind 0-2 from Barcelona in the first round. Even the visitors luckily did not concede the third time during first-half injury time after De Gea blocked Sergi Roberto’s shot using his face. Entering the second half it was too late for Man United. Barcelona’s confidence has been formed. Ernesto Valverde’s side played very solid, displaying an extraordinary transition, confident from back to front. Barcelona’s confidence then produced the third goal scored by Philippe Coutinho in the 61st minute. Messi again began the attack that made Man United conceded. Messi’s gastric pass to Jordi Alba was then forwarded to Coutinho. The Brazilian winger then fired a hard kick from outside the penalty box into the top left corner of the goalkeeper De Gea who as usual did. There is no turning back for Man United after trailing 0-3, because they have to score five goals to qualify for the semifinals. Man United were increasingly frustrated after their efforts to score were thwarted by Ter Stegen. The German goalkeeper superbly blocked Alexis Sanchez’s header at the end of the second half. Overall Barcelona deserved to win. The Blaugrana were superior to Man United, starting from possession (63 percent), opportunity (six shots on target), to accuracy of bait completion (92 percent). Man United failed to stem the strategy of the Barcelona game. Simply put, Barcelona only relied on wing play, minimizing mastery of Man United’s ball, and allowing Messi to do his magic. Ole Gunnar Solskjaer’s decision to lower Victor Lindelof as right-back was also a mistake. The Swedish defender was unable to keep up with the speed of Jordi Alba who was Barcelona’s best player after Messi. The Man United defense line actually plays quite disciplined despite looking fragile against Messi’s individual actions. But, Barcelona plays smartly. They don’t have to enter the Man United penalty box to score. Evidently three goals lodged in De Gea’s goal all created through kicks from outside the penalty box. Especially for Messi, the Barcelona captain again managed to silence criticism after an unconvincing performance in the first leg. Messi gave Chris Smalling, the defender who made him bleed at Old Trafford, a bad experience he would not forget. Messi has statistics on three kicks on target, two goals, and 81 percent accuracy of bait. If you see these statistics this is not the best game of La Pulga. But, the game was enough to make Phil Jones and Chris Smalling desperate.